May brought us its fair share of bad news, controversy, and cool writing tips. Here’s my roundup of internet literary news for May 2014. I remember very clearly the class at the University of Michigan when I read I Know Why the Caged Bird Sings. 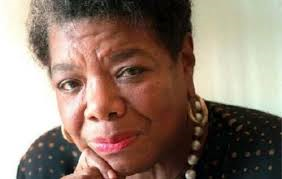 Maya Angelou had a huge impact on many writers and readers during her long writing career and will be missed. A memoir about a young holocaust survivor killing a Nazi solider and fleeing into the woods to be adopted by wolves sound like something Hollywood might cook up, and in the end the memoir turned out to be untrue. Misha Defonseca was order by a judge to repay$22.5 million from Misha: A Mémoire of the Holocaust Years. It turns out that she was in school in Belgium during the time period portrayed in the memoir. Writer/producer Javier Grillo-Marxuach wrote a compelling case for why TV shoes such as Lost and Breaking Bad relied on an operational theme to drive the show (independent of plot). The applicability, though, extends to fiction (and perhaps even poetry) – it is valuable for writers to understand theme as much as character, plot, setting, and voice. Writer and critic Seth Abramson created a heated debate on Facebook, Twitter, and multiple sites after publishing The Last Words of Mass Murderer Elliot Rodger Remixed Into Poetry on Huffington Post. Although he provided rationale for his metamodern poetry, some questioned whether he was using the incident for personal gain and that it is always too soon to grab personal attention for a tragedy. Some writers encouraged others to contact HuffPo editors to remove Abramson and Omnidawn issued a statement about their disappointment in Abramson, co-editor of Best American Experiment Writing, and that they would not be publishing future volumes of the anthology. Others have supported Abramson’s intention to try to craft art out of senseless violence and have called on those piling on Abramson to look harder at his stated intention behind the poetry remix. Should Books Assigned in Colleges Contain Trigger Warnings? There is a debate brewing about whether some books assigned in literature classes should include warnings of subject matter that could cause undue stress. A draft guide on trigger warnings from Oberlin College cited Chinua Achebe’s Things Fall Apart. These trigger warnings were also proposed by a Rutgers student earlier this year for a variety of scenes that reference gory, abusive, and misogynistic violence in F. Scott Fitzgerald’s The Great Gatsby. This topic continues to spawn a lot of discussion online and in social media.